"I can eat again. I can eat anything. What a great feeling." If you are self-conscious about missing teeth or wearing dentures, there’s an alternative that may be right for you: dental implants. Dental implants are one option for replacing missing or badly diseased teeth. A dental implant offers comfort and stability and is the restoration of choice because it is the closest thing to a natural tooth. Implants are manufactured "anchors" that look like cylinders or screws. They are artificial replacement for natural tooth roots. Implants are used in upper and lower jaws. They are made of titanium and other materials that are well suited to the human body. They attach to the jaw bone and gum tissue to become a stable base for one or more custom artificial replacement teeth, called dental crowns. 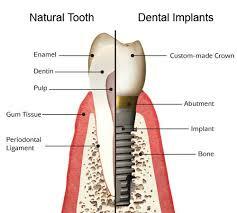 Dental implants have been used for several decades. Patients of all ages have chosen dental implants to replace a single tooth or several teeth or to support partial or full dentures. It’s no surprise that dental implants and their crowns help restore the ability to chew food. They help fill out a face that otherwise looks sunken because of missing teeth. Unlike dentures, implants and crowns are not removed for overnight soaking and cleaning. No adhesives are needed. Treatment usually is a three-part process that takes several months. In the first step, an implant is surgically placed in the jaw. The gum is secured over the implant and remains covered for 3-6 months while it fuses with the bone, a process called "osseointegration." Surprisingly, this process usually has very little pain associated with it and the only pain medication required is in over-the-counter medication like Ibuprofen. In the second step, the implant is uncovered and Dr. Melissa attaches an extension, called an abutment, to the implant. In the third and final step, Dr. Melissa makes a crown, which has a size, shape, color and fit that will blend with your other teeth. Once completed, the crown is attached to the implant abutment. 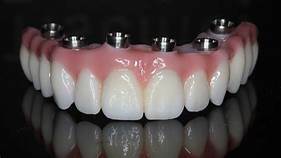 It is amazing because the new "implant-crown" will feel just like a natural tooth.Another option is to make a denture "snap" into the dental implant with special attachments that are like rubber gaskets. This allows denture patients to eat hard foods again and not worry about their teeth shifting and moving in the mouth. Who's a good candidate for implant treatment? You are, if you’re in good health and have plenty of healthy gums and adequate bone to support an implant. You must be committed to good oral hygiene to keep your mouth healthy and to scheduling regular dental visits. Ask Dr. Melissa if implants are an option for you. 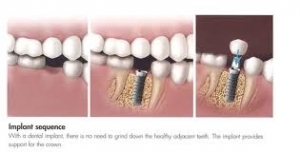 Yes, dental implants can provide artificial teeth that look natural and feel secure. Dental implants can also be used to attach full or partial dentures and replace bridges. 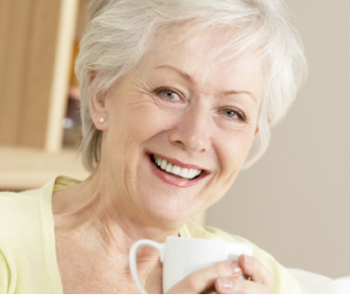 Ask Dr. Melissa about "Snap-In" dentures or "All on 4.". What is "All on 4"? The term All-on-4 refers to "all" teeth being supported "on four" dental implants, a surgical and prosthodontic technique for total rehabilitation of the edentulous patient or for patients with badly broken down teeth, decayed teeth or compromised teeth due to gum disease. It consists of the rehabilitation of either edentulous or dentate maxilla and/or mandible with fixed prosthesis by placing four implants in the anterior maxilla, where bone density is higher. 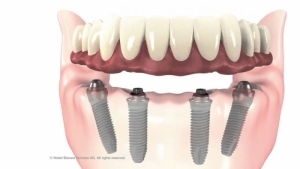 The four implants support a fixed prosthesis with 10 to 14 teeth and it is placed immediately, typically within 24 hours of surgery. 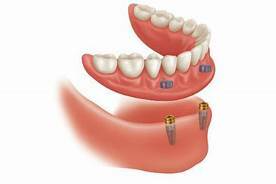 Usually the maxillary arch requires 6 implants and the mandibular arch requires 4 implants. After a 3-D scan of your teeth is performed, we can determine the best plan for your mouth. What are the benefits of "All on 4 or All on 6"? What are "Snap in Dentures"? ﻿If you’re interested in restoring your teeth with dentures but don’t like the feel of traditional full-palate dentures, snap-on dentures may be a good fit for you. Family and Cosmetic Dentistry of Kokomo offers snap-ons and other types of dentures at our office. Snap on dentures are a removable, palate-less denture that snaps on and off as many times as needed. The snap or "clip" happens when the denture is pressed gently onto the head of an implant. This provides a removable solution AND a strong bite! Snap on dentures provide the strength and stability to eat the foods you like, such as nuts, apples, carrots, etc. Snap on dentures are NOT permanent dentures. They must be "snapped-out" and cleaned every day.